Greetings from the road! That's right people I am in Venice, Italy of all places and I've decided to try this blogging from the road thing while on vacation. Though it's a double edged sword since I'm supposed to be relaxing and taking in the sites not staring blankly at a computer screen (with an achingly slow download speed--curse you vodafone!) working my brain around what food I should write about. But happily and both sadly at the same time, while sitting in a trattoria watching people go by, me and the SO (yes he's here too) were enjoying our glasses of wine al fresco looking over the remnants of our so-called dinner with disappoint only moments after musing "can you really get a bad meal in Italy?" And sadly we found out--YES, YES YOU CAN. It all started as we neared the dinner hour and had been walking around the city all day. There are any number of cafes, ristorantes, trattorias, you name it, that dot the narrow sidewalks of the town. The all pretty much look the same and also all offer pretty much the same. Most of the variation we had seen was in prices. Closer to the tourist areas the higher the prices, of course. We were headed to catch the Vaporetto (that's their version of BART but on the water) back to our hotel but decided to stop and get a bite to eat before hand. Since we were both hungry we went with the first place we saw and this is how it all started. Choices, sometimes there can be too many. It's a problem I run into every now and then when I'm out wandering the city. I get hungry but am not always sure what I want to eat and I find myself staring at menus on windows waiting for anything to strike my particular taste buds. (It drives the SO crazy) Eventually I reach a point where I'm just like f**k it and I'll walk in someplace and get what I get. Sometimes this works out, sometimes it's nothing but trouble. (Again, this too drives the SO crazy) On a recent weekday off I had this particular problem when I found myself in Hayes Valley, which has a fair number of things to choose from and I've been to a lot of them. But I wanted a different place and didn't want to spend too much and wasn't sure what I was looking for and so on. That's when I walked by Arlequin and kept walking and then ultimately turned around and decided to give it a try. A man walks into a bakery and....that's not exactly the start of a joke but more like me 2 or three days a week. Bakeries are like bars to me--I won't usually pass one by without going in to try something. And no people I DO NOT HAVE A PROBLEM! I just like baked goods but they gotta actually be good if I'm gonna walk back through those bakery doors again. Usually one good cookie will do that for me and while some folks search this town for the perfect burrito or best burger I'm on the lookout for the exceptional cookie or the lushest cupcake. It's that search which brought me to my latest foray The Pasty Cupboard. SFMade is a San Francisco non-profit that helps support local businesses that are home grown, produced and made in the city. Their members are a diverse collection of small to biggish companies and many of them are folks who specialize in some kind of food. Every now and then SFMade has special events that include factory tours of local companies. Since I like to see how the food is made I sign up for as many as I can go to (plus they are free) and it's an interesting behind the scenes look at the whole process of making the food stuffs we consume. One such company that opened it's back doors was Kika's Treats and, well, they make baked goods and sweet things so of course I'm gonna go and check 'em out. This is Kika and she makes treats! YOUR WEEKLY DIGESTION OF FOOD NEWS TO CONSUME...STILL IN SWEETS WEEK WITH WAFFLE DONUTS? 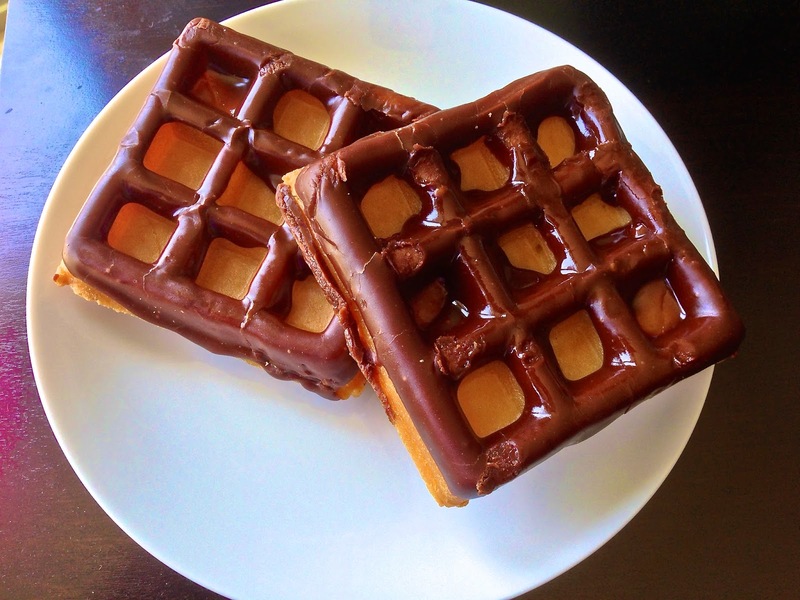 So Safeway is trying to make the waffle-nut a thing--a cross between a waffle and a donut. The texture was a little weird, somewhere between cake and waffle but it was too chewy. And the glaze plus chocolate glaze had this odd metallic aftertaste that pretty much overpowered the sugar rush you are gonna get from the thick layer on top. And in total honesty here, I did warm it up some and add a little butter to it, because you know it is a waffle of sorts, but even that couldn't overcome the taste and texture shortcomings. Oh well, nice try Safeway, please stick to cinnamon buns like you make at the at Church and Market. And why can't every store make them like that and why can't my local Safeway in SOMA actually carry some. OMG I have so many questions. SUGAR RUSH!!! 10 vegetarian-ish sandwiches to check out in the Bay Area for those inclined. Zagat says these are 6 over-rated restaurants in town--though no one is too blame except possibly tourists and um....Zagat guides themselves for sending folks there? Massive food halls are all the rage now and mid-Market Street is getting itself one. I guess if you must have a breakfast burrito these places are better than Taco Bell. Tablehopper's chatterbox is full this week and I think I see pastries!! SFGate has a duh! Really! article about how food trucks are the new food court. 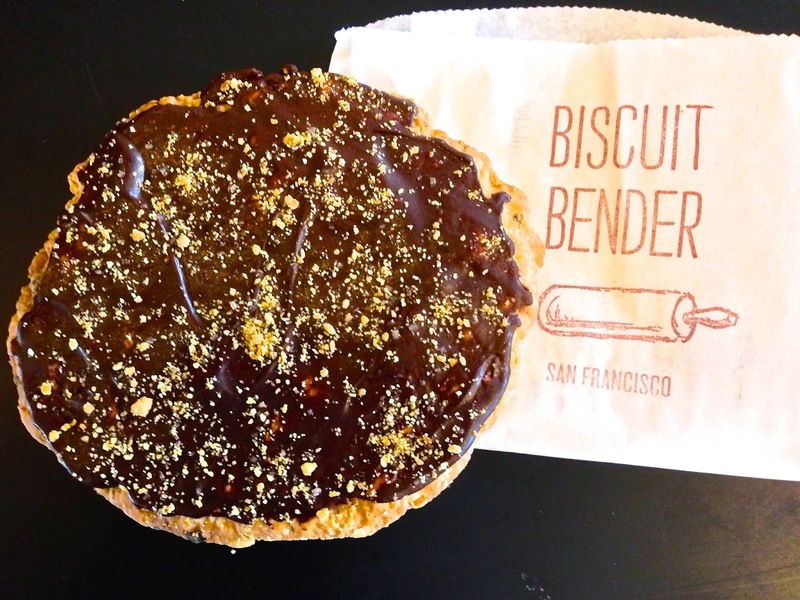 San Francisco Magazine tries to pick the years hottest food trends. An historic Chinatown location gets a new lease on life and hipster chef. 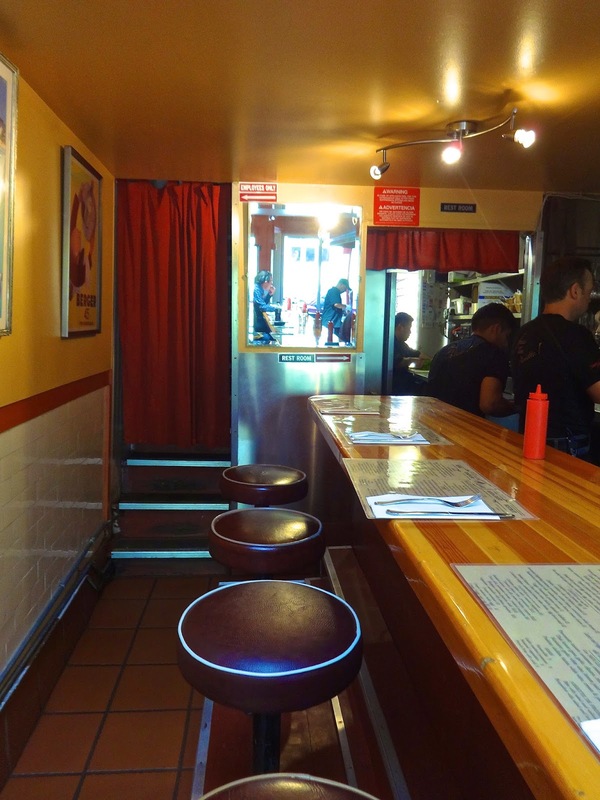 Bon Appetit magazines new list of best restaurants includes some SF faves. Another San Francisco institution bites the dust after 22 years near an underpass. Krispy Kreme, a name that can evoke squeals of joy in the donut obsessed or strike fear in the hearts of the no-carb eternal dieter. Me, I like 'em--they are light and fluffy and the raspberry is a favorite, but it's not like I'm gonna say no to other flavors. Plus they try out new flavors on a regular basis keeping things fresh. Right now I think they are trying out a banana pudding and carrot cake version. You can take a gander at some others clicking here. Fortunately for me the only one here in the Bay Area is down in Daly City and not exactly in a place I find myself near on any kind of a regular basis. Still, if perchance it happens I'll pop in to see what's going on. Thing about The Krispy is that they are all over the place and they also originated in Winston Salem, North Carolina--my home state. I remember growing up there how they used to sell packaged Krispy Kreme donuts in the grocery stores, thus they weren't quite so magical, but tasty nonetheless. On a recent trip home I noticed they were expanding their supermarket offerings to include glazed fried pies and being the sweet junk food lover I am, I most definitely had to try 'em--all of them. Bob's Donuts (and Pastry Shop as they like to call themselves) is considered an institution here in San Francisco and they have been around (way) long enough to be considered one. It's one of those places that shows up on folks best of lists for donuts-particularly when that craving for sweet stuff hits really late at night or being that it's on that stretch of Polk-strasse that has a few bars and things--when you are kind of drunk, semi-drunk or really drunk and need something to fill a need that only deep fried will satisfy. I know for a lot of folks that is exactly what Bob's does for them, and if truth be told, 10 or more years ago I myself used to hit up the place after imbibing a few at a nearby watering hole. Over the years I've moved on (from booze) to other sweets as the proliferation of bakeries in town has grown. But even with that abundance, Bob's has remained and I was in the hood, during daylight, recently and thought as I walked by..hmm..why not see if the array in the window stands up to taste on a bright sunny afternoon as well as they would on a dark boozy Saturday night/Sunday morning. It's no secret I've been to the SOMA StrEat Food Park any number of times and on almost every occasion I see one or two trucks that I've seen there or at other events and think, eh, nothing special, because I'm looking to really invigorate my taste buds. One such truck I've seen a lot and avoided has been Gyros On Wheels--not because I think it's bad or anything it's just, you know, gyros--that's something I can pretty much get anywhere in this town, so not exciting. Yet, on this particular Sunday, I thought, WTF, I'd pretty much tried all the other trucks there that day so why not them. Sometimes restaurants get known for a particular dish which can be both a blessing and a curse. If the dish is really good it can bring the folks in to give it a try but it can also cause a place to be too crowded for locals. Or the other dishes can get neglected and things can slide to where the staff don't care and they just roll their eyes and take your order without much thought. Or in some cases the place soldiers on doing what they do well and meeting all expectations in other areas of food and service. 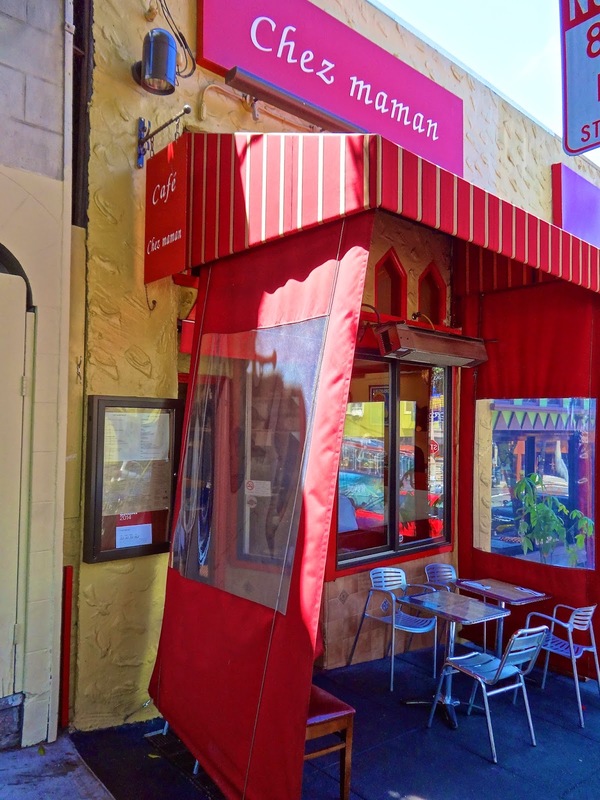 One such place is Chez Maman, the original location in Potrero Hill (they have an off-shoot now in Hayes Valley). 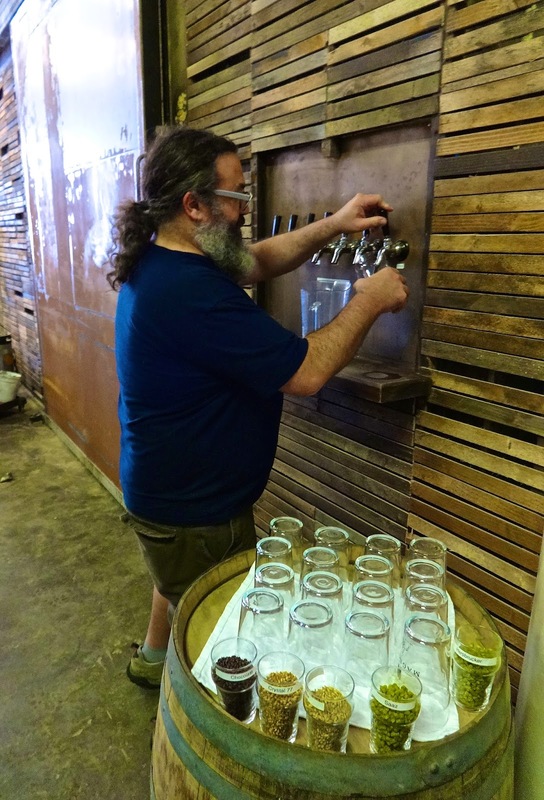 This is Dave--he has a brewery. This is Daniel--he has a noodle shop.